DES MOINES, Iowa — At the Iowa State Fair, the walk from the William C. Knapp Varied Industries Building to the swine barn should take about five minutes. But with Sen. Charles E. Grassley, it takes 45. Since the Republican was first elected to the Senate in 1980, Grassley, the Hawkeye State’s senior senator, has never been re-elected with less than 64 percent of the vote. At the Iowa State Fair, it is easy to see why. On Friday, Grassley could not travel more than 10 feet without people stopping to shake his hand, get a picture or tell him how he great he is. GOP candidates agree with that sentiment: He was at the fair to campaign with Joni Ernst, the Republican nominee for Senate to succeed retiring Democratic Sen. Tom Harkin. “I’d like to introduce you to someone. This is Joni Ernst, she’s running for Senate,” Grassley says, time and time again. The two pose for a photo with Peabody, the 1,273 pound winner of the Big Boar title. It&apos;s one of three things Grassley says he makes sure to see at every annual state fair; the other two are the Big Bull and the Butter Cow. Grassley also recommends a trip to the pig-birthing barn. "They have sows conceive at certain times, so that there’s always baby pigs being born. So you should probably go see that if you want a real education," he said. Recognizing the stunned reaction, he adds, "I mean, it’s clean and everything." “Grassley!” people yelled as they walk — not "senator," or "Senator Grassley." It&apos;s just "Grassley," like he’s an old friend. And in some ways, he is. The senator has an uncanny ability for remembering people he meets at the fair – where he met them last year, what they were doing at the time, what they talked about. 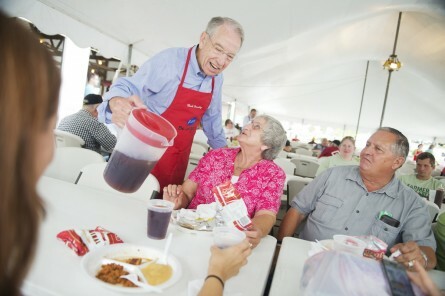 On Saturday morning, Grassley is scheduled to serve iced tea at the pork producer’s tent, an annual pilgrimage for candidates and pols. It&apos;s the perfect Iowa photo op: Ernst and her opponent, Democratic Rep. Bruce Braley, cook pork burgers and tenderloins, wearing red aprons with their names printed on it. Aides and reporters hang out and chat while they watch; photographers crowd around the grill to take pictures. Grassley gets his apron, but instead of heading to the grill, he picks up a pitcher and walks from table to table, chatting as he refills glasses. An aide explains he prefers pouring iced tea over grilling pork because he likes to talk to fairgoers as much as they enjoy talking to him. His former chief of staff, David Young, now the GOP&apos;s nominee for Congress in Iowa’s open 3rd District, follows suit with a pitcher of water. An hour earlier, Grassley is at the Varied Industries building, chatting with Young and voters at the state GOP&apos;s booth. As people stop to shake hands and take pictures with Grassley, he introduces them to his former staffer. “You’ve never heard of Sen. Grassley?” gasps Young in mock horror at Sam and George, two kids around 10 years old who say they do not know the senator. “It’s OK, their parents do,” laughs someone off to the side. Young promptly introduces them to remedy the situation. 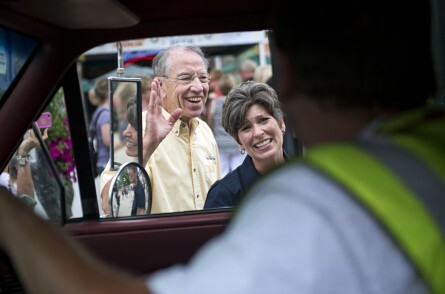 On Saturday, Grassley’s wife, Barbara, tags along. She stands a full head shorter than her husband and has a shock of curly white hair. Barbara Grassley also journeys to the state fair every year. She says that she can always tell what type of cow the butter cow is modeled on, launching into an explanation of the physiological differences between breeds of cows. But this year, she says, she cannot figure it out. She shows off an official state fair charm bracelet to Louisiana Gov. Bobby Jindal’s children, explaining that she buys a new charm each year. “Look, I have two cherry pies,” she notes gleefully. The crowd only grows with Jindal there, and the minutes tick by with voters stopping to meet all three politicians. When it is clear Jindal will be difficult to move from his spot, Grassley and Young take their leave. Grassley, his wife explains, does not like to be late. As he walks, Grassley asks if CQ Roll Call has taken his suggestion and visited the pig-birthing barn. An aide warns they should make the trip: Grassley will certainly remember, and he will ask about it back in Washington, D.C.
Related Stories: In Iowa Senate Race, It&apos;s Personality Versus Policy Democratic Retirements Put the Senate in Play Jindal Calls McAllister an &apos;Embarrassment&apos; Top 10 Most Vulnerable Senators Roll Call Election Map: Race Ratings for Every Seat Get breaking news alerts and more from Roll Call in your inbox or on your iPhone.